This is a blog of random musings. My avatar is Stanczyk. Stanczyk is a jester, not a fool exactly, but more a sage — funny but worldly and concerned. Of course, he is Polish. I like to muse upon history, politics, genealogy (much about Polish genealogy), religion, science, art, University of Michigan, books, technology, STEM and miscellanea. Perhaps one of my musings will inspire you (at least to comment). If that is the case, then I truly may be a Muse. Of course, jesters are known to opine and speak truth … These opinions/truths are my own and do not reflect/represent the opinions of my customers, lawyers, or any agencies contracting for my skills for themselves or their customers. Biechow, Pacanow, Zborowek, Stopnica, Swiniary, Szczebrzusz, Dobrowoda, Opatowiec, Beszowa, Olesnica, Staszow, Nowy Korczyn, Chotel Czerwony, etc. and possibly even Szczucin (in the Austria-Poland partition). These are parishes, so there are a lot of other nearby villages (i.e. Piesztrzec, Kwasow, Rataje, Falecin) that also appear in my genealogy. Alexander, Sigismund the Old and Sigismund Augustus (all of the Jagiellonian Dynasty). Stanczyk makes jests and uses sarcasm/satire to speak truth to all. P.S. My portrait was painted a number of times. 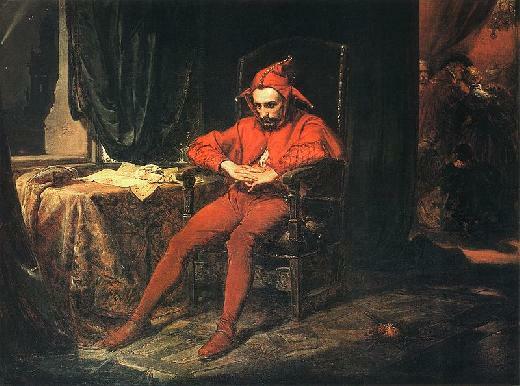 This vignette I use, is from Jan Matejko. P.P.S. — Stanczyk is a nom de plume of a genealogist/computer expert from MI now living primarily in the Philadelphia area. Welcome to the blog. You seem to be new to genealogy. Perhaps you can benefit from a free trail at ancestry.com. If you have the means, there is an excellent Genealogical Society for the Mass. area: NEGHS (New England Historical & Genealogical Society = http://www.americanancestors.org/home.html). I think they may be of help to you in your search. I am in the process of researching the Pytko wing of my family tree, and I recently found out that they originate from the parish of Pacanów, though I’m not sure exactly where. It would appear that the LDS doesn’t have microfilms for the parish, though it does for Biechów. Any help you may be able to give would be very much appreciated. My great-great-great grandfather was Józef Pytko. He died in 1874 in Kloda, a little ways to the northeast of Pacanów, and his wife Aniela Bielski [?] died there in 1881. His death record, based on a loose translation I’ve been able to obtain of the Russian record, says he was 59 when he died. He had three surviving sons and two daughters. I know that my great-great-grandfather was born in Kloda, but I think his siblings were born in Pacanów. I’m assuming that Józef and Aniela were married there, too, but there’s no way to know unless I can find the marriage record. Have you come across any information that might be helpful? If you have an email address, I could perhaps send you more information. You seem to be able to translate the Old Russian, which I think is impossible to read! I do not know if my prior response went through or not as my screen winked out as I was “replying”. Thanks for writing. As for emails – you can send me A church record and I will be happy to read it for you and send you a translation of the “Old Russian” (pre-1918 reforms). You can write to me at: Stanczyk@eliasz.com . OK? The more jesters, the merrier!